Open Corrupt Access Database to recover all access files likes tables, relationship, queries and forms etc that were corrupted due to any reason. Open Access Database tool to Open Corrupt Access Database which Restore Access Files including tables, queries, forms, reports, pages, macros, modules etc. Compress the file size of one or many MS Access files. Some Access files do not compress as well as others. Results may vary. Access 2000 or higher required. .
Horizontally merge two MS Access tables into one by a common column (field) of data. The two tables can be located in the same Access file or two different Access files. Access 2000 or higher required. Horizontally merge two MS Access tables into one by a common column (field) of data. 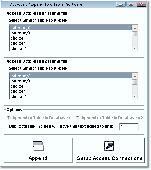 The two tables can be located in the same Access file or two different Access Files. The two tables are not changed, a new table is created with the results. Access 2000 or higher required. An advanced utility which helps you convert your MDB (MS Access) files to any format you wish (XLS, DBF, CSV, XML, PDF, HTML, CHM, RTF, HLP, DOC, and many more). Supports a batch conversion, a run from command line, more than 50 languages. Free 5GB secure online data storage account. Conveniently access your files anywhere - at work, home, or halfway around the world - using only your browser. Access database repair software uses quick algorithm to search & retrieve data from the corrupted database files & displays the preview of the damaged database using Live sample technology. Turn your personal computer into an Internet kiosk or a public access workstation by disabling access to files installed on your PC while giving full access to all necessary applications you specify including Internet Explorer. This shell enhancement allows you to access your files quicker. Click on a folder icon, hold mouse button pressed, and a menu will appear displaying the folder's contents. Navigate the menu and its submenus, and locate even a deeply buried file!